This guidebook entry was created by Dana Ludington. HISTORY: The area, which is now Buck’s Lake, was first claimed by Horace Bucklin and Francis Walker in 1850. They named the valley Buck’s Ranch. The ranch, composed of 1,200 acres, went through several owners, becoming more and more developed with farm buildings, barns, a post office, a store, and a hotel. The Beckworth Trail, which ran from the Sacramento Valley to the mines in Quincy, passed through Buck’s Ranch. The ranch became an important supply point for the mines. In the mid 1920’s the valley was purchased by Feather River Power Company who planned to establish a hydroelectric reservoir. During the construction of the dam, the ownership was bought by the Great Western Power Company and then in the 1930’s was bought by the Pacific Gas and Electric Company who still own the land and reservoir today. The power plant began operating in March of 1928. PG&E leased much of the land surrounding the reservoir for private use. The rest of the land surrounding PG&E’s holdings was public land and managed by the U.S. Forest Service. Some of the public land was also leased to private parties and some of the public land has been designated the Buck’s Lake Wilderness. DESCRIPTION: The area surrounding Buck’s Lake is land primarily owned by the National Forest Service with a number of private land holdings. The forests are dominantly evergreen forests of White Fir, Red Fir, Douglas-Fir, Lodgepole Pine, Ponderosa Pine, Jeffrey Pine, and Incense-Cedar. There is also a population of deciduous trees, including Dogwood, Aspen, and Alder which provide incredible colors in forests in Autumn. This area is also home to a very diverse population of wildlife, such as deer, black bear, coyote, Mackinaw, German Brown Trout, Rainbow Trout, Brook Trout, Kokanee Salmon, and a variety of birds. This area provides an array of recreational activities, including fishing, hunting (during hunting season), lake kayaking or canoeing, hiking, mountain and road biking, swimming, snowmobiling, cross country skiing, road skiing, and backcountry skiing. The Buck’s Lake area also provides easy access to the Buck’s Lake Wilderness. DIRECTIONS: From Quincy, CA take Buck’s Lake Road (Quincy/Oroville Highway) West for approximately 14 miles to Buck’s Summit. SUN EXPOSURE: The entire trail is fairly shaded. Certain sections receive more sun than others. In general, the South side of the loop trail receives slightly more sun exposure than the North side of the loop. GEAR NEEDED: Hiking shoes or mountain bike, water, and food. 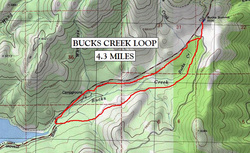 DIRECTIONS: The Buck’s Creek Loop Trail starts from the Southwest end of the Buck’s Summit parking lot adjacent to the Pacific Crest Trail. From Buck’s Summit, the trail parallels the left side of Buck’s Lake Road for about 3 hundred feet. The trail then begins to drop downhill. After about a ½ mile the trail will cross a dirt road (Forest Service Road 24N29Y) and then split into the loop. The loop trail can be traveled either direction. DESCRIPTION: The Buck’s Creek Loop Trail descends approximately 300ft in elevation and ascends the same. It was reconstructed in the fall of 2010. It has now become a very smooth and easy-to-follow trail that provides easy travel for hikers and mountain bikers. There are two creek crossings and a number of elevated turnpikes through marshy areas. The trail parallels the Buck’s Lake Road closely in two areas. The trail passes through a number of beautiful riparian zones as well as dry, exposed meadows, and large fir, Lodgepole, and ponderosa pine forests. 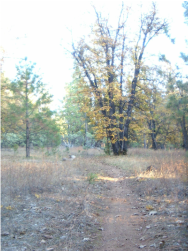 This trail also provides opportunities for wildlife sightings as it travels adjacent to deer, bear, coyote, bird, fish and many other animal habitats. During the fall, from this trail, you can see the beautiful Kokanee Salmon spawning in Buck’s Creek. Since this area is not located within the boundaries of the Buck’s Lake Wilderness, the trail provides opportunities for bicycle and horse travel. This guidebook entry was created by Henry Freimuth. town of Keddie turned into a locally famous resort town up until the early 1980’s. Close to the “Cascade Loop” trail is a summer camp called Oakland Feather River Camp. OFRC was first opened in 1924 on federal land leased by the U.S. Dept. of Agriculture. The camp has continuously operated ever since. The Idea was intercity youth would benefit from a week or two of beautiful mountainous retreats every summer. It has been, and continues to be, a popular destination, for summer retreats, mainly the folk of the California’s bay area community. · It is suggested that during the fall biking is best in the mornings, summer biking around before dusk and spring early afternoons. DESCRIPTION: The run begins on and old USFS/Logging road. The road is in good condition, capable to bike quickly. It is pretty much even terrain for about the first ½ mile. Then you climb gently for 180’ ft or so. Once the road ends, a single-track opens up (approximately half the run is single-track), to include a good downhill. The downhill descends 550’ft. The downhill is not too technical; it does have some loose river rock in spots though. Once creek side, a good flat single-track up, and a tiny meadow appears, until about a ¼ mile before the cascades. At that point the single-track becomes a little technical; due to the fact the run comes parallel to the river, and erosion has added some caution to turns and dips. You know you are at the cascades when you go over the first walking bridge. The terrain stays mostly the same until the run leaves the riverside, which is where a well maintained county road is entered. From this point on you climb uphill 650’ft on maintained and unmaintained dirt road, with a last couple mile gradual descent of about 260’ft thus finishing the loop. the intersection of Chandler Road (see fig. 2, blue arrow). Follow Chandler Road until you reach a dirt road on your left. This guidebook entry was created by Miles Gallagher. HISTORY: In the past South Park has been used for logging by Sierra Pacific Industries. As you may know Quincy is a very big logging town with one huge mill that runs 24 hours a day. You will commonly see lumber trucks leaving town empty and returning full of trees. Although SPI developed most of the road systems, they are not in use any more. DESCRIPTION: The South Park trail system is one of the primary trail systems close to the town of Quincy. It sits at the base of Mt. Hough and the North East corner of the American Valley. The trail system consists of approximately 25 miles of generally high quality user made, flowy, wooded singletrack, with a sweet descent to Spanish Creek and the Cascades; a series of waterfalls that only a few of the gnarliest local kayakers have ever survived. DIRECTIONS FROM QUINCY: From intersection of Quincy Junction Rd. and Hwy 70, head out Quincy Jct., at your first stop sign take a left onto Chandler Rd., drive approximately 1.5mi, when you cross over the bridge stay left, after the 1.5mi you will see a forest road that heads up to the right (see pic. ), it will have two roads split by a tree in the middle. You may park here to start your ride. Time Needed: About an hour on a mt. bike. Elevation: Starting at 3,500ft and climbing as high as 4,000ft. Rating: Intermediate, there is steep climbs but not very long and tight turns through narrow trees on the descent. Gear Needed: A mt. bike, no suspension required, helmet, water, these directions. Directions: From parking area head straight up road, go around the yellow gate and continue straight through intersection above gate. Ride on this road for .5mi then stay right at fork (pictured) and almost immediately take a right at the T.
Continue riding on this road as it winds and climbs for about .5mi, you will come to a four-way intersection with single tracks on the left and right, take the left trail that heads straight up into tight switchbacks. You will continue over multiple peaks and drops and finally there will be a jump (of sorts) in the trail, just after it stay right. Continue your downward decent and just before you come into flat Manzanita there is a sharp left turn onto a single track (almost a U turn). If you miss it you will know by hitting a Y with the right road having a hump across the entire road. Turn around and go up the way you came about 50yds looking for the single track. Just follow this straight for a good while and it will spit you back out of the road you climbed up on. About 1/8th mi take the first left that will be the first road you were on, continue riding and this will take you bake to the gate and eventually your car. RISKS On your descent of the single track the trees are very tight so watch you handle bars. There are wild animals as well: Bears, Deer, Mt. Lions, Snakes, ect. DESCRIPTION: South Park is an unofficial system of trails within Plumas National Forest. The majority of use that these trails receive is from mountain bikes. This trail system contains a variety of levels of difficulty, ranging from easy to moderate. DIRECTIONS: (from the stoplight at Main St. and Quincy Junction Rd. by Safeway) Turn onto Quincy Junction Rd., turn left on Chandler Rd., stay left on Chandler (veering away from Oakland Camp), about 2 mi. down Chandler Rd. turn on an uphill dirt rd. on your right (this road will come right after a dirt road on your right that is gated). You will come to a flat spot in the intersection of four dirt roads. Continue straight on the dirt road to enter South Park. 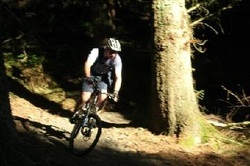 GEAR NEEDED: Mountain bike (front suspension recommended), helmet, closed toe shoes, water, gloves recommended. DIRECTIONS: Ride for 2 ¾ miles, shortly after you ride over a dirt-covered culvert (a large bump in the road), you will make a sharp left (about 127 degrees) onto a single track that begins to drop rapidly. You will stay on this single track until it meets Old Highway (a dirt road). You will ride down this road for ½ mile, and then take a right turn on another steep, dirt road. This road will lead you back to your car eventually. DESCRIPTION: The dirt road is moderately uphill consistently. Once you get on the single track you will drop downhill until you reach Old Highway. The single track is windy and skinny in places, but no drops. The ½ mile on Old Highway is slightly downhill and then you begin to climb on the dirt road back up to where you started. This climb is 1 ¾ miles. It will then level off and begin to drop down exactly what you came up in the beginning of the ride. RISKS/PITFALLS: It is likely that you may crash on the downhill single track trail and you may get dehydration if you do not drink water.